The NAACP, together with Yale Rule of Law Clinic, will sue the state of Connecticut in the first state-wide challenge to this practice, for its continued use of gerrymandering. The NAACP believes prison gerrymandering, a practice where incarcerated people are counted for redistricting purposes in the state House or Senate district where they are incarcerated, rather than in the district where they come from, dilutes the votes of Black and Brown communities and violates the Equal Protection Clause of the Fourteenth Amendment. The latest figures on the well-being of children show Connecticut ranks seventh in the nation, but children’s advocates fear troubles ahead. In the Annie E. Casey Foundation’s 2018 KIDS COUNT Data Book, Connecticut showed improvement in nine of 16 categories covering economic well-being, education, health, and family and community. Census figures are used to determine levels of federal support for child-focused programs, from school lunches to children’s health insurance.The federal programs are especially important to children in low-income families.Thirteen percent of Connecticut children live in poverty, unchanged from 2010 levels. The Albany County jail will be used to hold dozens of immigrants as part of an effort by federal authorities to find secure facilities for people arrested in a continuing crackdown by U.S. immigration officials. Sheriff Craig Apple said federal homeland security officials contacted sheriffs across the state recently seeking beds for immigrants arrested for “low-level” offenses.It is unclear whether the immigrants, who will be sent to Albany County jail, were arrested or what charges they will face. Federal authorities told sheriff’s officials the immigrants being detained at Albany County jail are from countries that include Nepal, Syria, Honduras, India, China, Guatemala, and El Salvador. The federal government will pay the county $119 per day for each person, which Apple said will help bring in significant revenue for the county. Nearly a year after a massive data breach that compromised private information for 143 million Americans, consumer credit agency Equifax has agreed to a series of new corrective measures as the result of a consent order with eight states, including New York. The consent order requires Equifax to develop a new risk assessment, improve oversight by their board, and submit a plan to address last year’s hack, according to a press release from the state Department of Financial Services. The City of Bridgeport is seeking community input to create a new Master Plan of Conservation and Development that promises to guide building and economic development policy over the next 10 years. According to Mayor Joe Ganim, the Master Plan will be created with extensive input from the community, identifying the most pressing issues today and the next decade, while proposing policies to address how Bridgeport should evolve over time. A six-month effort will be dedicated to update Bridgeport’s Master Plan of Conservation and Development created in 2008, known as Bridgeport 2020: A Vision for the Future. According to a press release from the Mayor’s office, the updated document will merge environmental integrity and community health with economic goals of growth and development. Hartford-based consulting firm Fitzgerald & Halliday, chosen to assist in updating the Master Plan, say the plan is to host public meetings and appear at events throughout planning process and encourage all Bridgeport residents to participate. With turnout nearly double what it was a year ago, voters on Long Island gave wins to two progressive newcomers in yesterday’s Democratic Congressional primaries. East Hampton businessman Perry Gershon won 36 percent of the vote to 30 percent for former Suffolk Legislator Kate Browning. Gershon will face Republican Lee Zeldin in the General Election. Meanwhile another first-time candidate, Liuba Grechen Shirley beat DuWayne Gregory, presiding officer of the Suffolk County Legislature, by 58 percent to 42 percent in the 2nd Congressional District primary. Liuba Grechen Shirley, of Amityville, will face veteran congressman Peter King in November. DuWayne Gregoryhad unsuccessfully challenged King in 2016. Zeldin and King easily won re-election in 2016, but Democrats clearly are trying to rally their base since President Donald Trump’s election. Shirley told Newsday: “This is a grass roots movement and it shows that people can stand up and fight back”. Yancey Roy reports in Newsday that a bill to help jump-start a new Southampton hospital won legislative approval at almost the last minute. The proposal, which would permit the hospital to execute a land lease for a new facility, was the second-to-last bill the State Assembly voted on before banging the gavel late Wednesday night and adjourning for the year. The proposal was approved 130-0. Stony Brook Southampton Hospital wants to move its entire facility from Southampton Village to Stony Brook University’s Southampton campus and build a new hospital “in the next five to 10 years.” It’s part of a plan that grew out of Southampton’s decision to join Stony Brook Medicine last fall. The hospital proposal was one of a number of Long Island bills whose fate hung in the balance as state legislators slogged through a 14-hour day to approve hundreds of bills before closing the 2018 legislative session. Southold officials could adopt code changes this summer on helicopter use to address residents’ complaints about passenger helicopters and other aircraft landing in farm fields for winery tours. According to Newsday, officials began discussing code changes last fall after residents complained about the wine tour landings and the potential increase in chopper noise. Councilman Robert Ghosio, who has been working on the proposed legislation, said officials felt a need to include stronger language to explicitly prohibit the landings. Only certain helicopter uses, such as crop dusting over farm fields are allowed by the present code. The Town Board should see a draft revised code at its July 3 work session. A public hearing on the changes could be held by early August. Emilie Munson reports in the Connecticut Post that Connecticut lawmakers decided Monday not to overturn any of Governor Malloy’s seven vetoes of bills they passed, often with overwhelming support, in the 2018 legislative session. The House narrowly approved an override of only one of Malloy’s vetoes — a bill that would have prevented him and future governors from cutting municipal education grants — but the override failed in the Senate. Some Democrats, who advocated for a school safety bill that would have changed the process for removing a child from the classroom, had a change of heart after public backlash from parents of minority and special education students. They decided not to try to override the governor’s veto. Senate Democrats also abandoned support of a bill that would allow pass-through entities to apply a manufacturing tax credit to their personal income taxes. Dozens of Connecticut companies asked for an exclusion from new tariffs on imported steel and aluminum, but only Schick Manufacturing Inc. of Shelton has received a waiver from the Commerce Department. President Trump’s policy aims to bolster the domestic steel and aluminum industry. But the impact falls on U.S. manufacturers that use imported metal. Connecticut Business & Industry Association vice president and economist Peter Gioia says: “Tariffs work just like taxes,” and increase costs. Schick Manufacturing, known for its razor blades, employs nearly 1,000 people at facilities in Milford and Shelton. It was one of the first seven companies granted exclusions to the new steel tariffs. Alfonso A. Castillo for Newsday reports the Long Island Rail will begin long-awaited construction on a third track for its Main Line in Nassau County late this year, comprising 10 major construction projects. The LIRR Expansion, the formal name of the $2.6 billion project, will begin with station renovations, bridge replacements, grade crossing eliminations and a new parking garage. The LIRR says these projects will allow greater resilience from service disruptions on its Main Line and provide capacity for extra trains, including reverse direction travel during rush hour. Supporters expect the project to increase property values and create jobs on Long Island. The LIRR Expansion project is scheduled for completion in early 2023. It will encompass 50 or so different initiatives. Project chief executive Mark Roche predicted 2019 as “probably the busiest year” for construction. Residents upset by excavation work being done by Suffolk County at the North Fork Preserve site in Riverhead want the project to stop. The county is installing retention ponds and drainage improvements to retain stormwater on the 307-acre site. Last summer, the Suffolk County Legislature found the proposed work would not have a significant negative environmental impact. The county’s Council on Environmental Quality recommended the project, which costs $200,000 and is financed by county bonds. For the Hartford Courant, Jon Lender recaps the history of Connecticut Transit's non-polluting hydrogen fuel cell bus project that began in 2007 and ended in 2015. In 2010 the project expanded to five buses by adding four buses featuring United Technologies' newest fuel cell power system. Each bus cost $2 million — four or five times the price of a conventional bus. They were paid for by the Federal Transit Administration under a “demonstration” project to see if the zero-pollution buses were financially viable alternatives to conventional diesel and diesel hybrid buses already in use. The impracticality of refueling was a drawback: the buses had to go to UTC Power’s South Windsor facility at night to refuel — and after a few years UTC left the fuel cell bus business. The last of the five fuel cell buses went out of service in 2015. The zero-emission buses worked well enough, the specialized support system required for fueling and maintenance had not materialized. Kelly Zegers reports for Riverhead Local that tomorrow, June 26, voters in the first Congressional District (CD-1) of Long Island will nominate one of five candidates challenging incumbent Congressman Lee Zeldin (R-Shirley) in November for a seat in the House of Representatives. The five candidates are: former Suffolk County legislator Kate Browning of Shirley; former Brookhaven National Lab physicist Elaine DiMasi of Ronkonkoma; Perry Gershon, an East Hampton businessman who has worked in commercial real estate; former New York City Council staffer David Pechefsky of Port Jefferson; and former Suffolk County legislator Vivian Viloria-Fisher of Setauket. Ms. Browning, who was a school bus driver while her children were in school, is running on a message that she will fight for working families. Ms. DiMasi’s credits her science background for her commitment to facts and truth. She’s campaigning on clean energy, jobs and the environment, and increasing trade schools to maintain a workforce up-to-date on clean energy technologies. Mr. Pechefsky, acknowledging his experience working in government, is running to make the economy work for everyone and favors infrastructure investment. Vietnam veteran Clifford Graebe had never felt fully comfortable without access to a gun since he was shot through the thigh in 1970, during a jungle encounter near the Demilitarized Zone. But in 2015, as Martin C. Evans reports for Newsday, police responding to a home burglary call, found he had an unregistered handgun. Graebe, 69, was arrested, facing charges that could have landed him in jail. Fortunately, Graebe says, his recently resolved case was handled in Suffolk County’s Veterans Court, by a judge who was himself a combat veteran. Those veterans courts that divert eligible former service members from the traditional criminal-justice system, are designed to address conditions that may have contributed to such post-traumatic stress disorder, brain injury, substance abuse, anger, unemployment and homelessness. Suffolk County Veterans Court was set up in 2010 with another in Nassau County. The first was established in Buffalo in 2008. After discovering that two former officers falsified reports, New Haven Police Chief Anthony Campbell has contacted the state and U.S. attorneys’ offices about possible criminal charges and civil rights violations. The police department recently learned two officers had falsified background check reportsduring the hiring process for officer candidates. The officers who handled the reports were removed from their positions and later resigned following an internal investigation. The department’s Internal Affairs Division and Investigative Service Division are investigating each candidate’s file and put hiring on hold. No apparent pattern of falsifications has come up in the investigations. But the department is looking at all members of the unit to make sure the incident wasn’t more extensive. Campbell said the department is aiming for more transparency beginning to implement safeguards so this doesn’t happen again. A farm bill narrowly approved by the U.S. House Thursday would cut thousands of children from free school meals in Connecticut. The bill would limit eligibility for the food stamp program and free school lunches. Currently, Connecticut children qualify if their families earn no more than 185 percent of the federal poverty level, or $44,955 for a family of four. But under the bill, eligibility would be capped for families of four at 130 percent of the federal poverty level, or $31,980. End Hunger Connecticut! executive director Shannon Yearwood said the bill would end or threaten free lunches for many Connecticut school children. She called the farm bill a “sneak attack on our schools.” Farm bill supporters say the legislation closes loopholes. The Congressional Budget Office estimatesmost students who would lose their free lunches could qualify for reduced price lunches that cost 40 cents each. The New York State Senate approved a resolution to provide a record $1 million to fight the scourge of Lyme and tick-borne diseases throughout the state. North Fork Deer Management Alliance member and scientist John Rasweiler said in an internal memo: “The available scientific evidence simply does not support the continuation of Shelter Island's four-poster program. After 10 years of deploying these devices, tick sweeps continue to pick up significant numbers of black-legged ticks.” He added that a meaningful reduction in the deer population was supposed to accompany the program, but has not happened. Rasweiler said he provided the Senate with information “which detailed why four-posters are unworkable and a public health hazard.” However, his comments were dismissed. As reported earlier this month, Southold warned vineyards that allowed food trucks to sell food that it violates residential and agricultural zoning rules. Now, the town will issue citations to wineries found not in compliance. Some of the speakers at a rally Wednesday in New Haven opposing the Trump administration’s immigration policies were young immigrants who told, through an interpreter, harrowing stories of family separation. WPKN’s Melinda was there. Hazel Mencos was 13 when she and her aunt were arrested at the border and separated. Even though she spent relatively few days in detention, compared to many other immigrants, four years later she broke down describing the freezer where she was kept, the horrible food, and the isolation and terror she experienced. “If I can raise my voice now, I will do it and I hope that those children in cages someday will read the news and know that many people on the outside did something for them to be liberated. 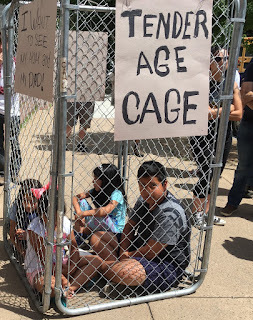 Right before the rally, responding to the fierce bi-partisan opposition to his policy, Trump issued an executive order to keep families together who are detained at the border but they would still be incarcerated. It also does nothing to reunite those families already torn apart. That was not a solution for the members of Unidad Latina en Accion, who organized the rally. For Newsday, Rachelle Blidner reports that a group of Latino residents and advocacy groups is suing Islip Town, claiming the system of electing the town board by town-wide majority vote rather than council districts has prevented Latinos from having equal representation in Town Hall. The election system violates the Voting Rights Act and perpetuates neglect of Latino communities, including Brentwood and Central Islip, according to the suit, which seeks to create council districts. “Lacking any representation on the Town Board, members of the Town’s Latino community have been demoted to second-class citizens,” according to the suit. Town voters rejected a ballot measure to create council districts in 2006 after several petitions for a referendum were blocked over a decade. The lawsuit was filed in federal district court in Brooklyn on Monday by Brentwood by residents Ana Flores, her father, René Flores, María Magdalena Hernández and Magali Roman, and advocacy groups Make the Road New York and New York Communities for Change. Defendants include the Islip Town Board and the Suffolk County Board of Elections. Brendan J. Lyons of the Albany Times Union reports: Public prosecutors in New York are protesting a bill passed by the New York legislature this week that would allow it to investigate prosecutorial misconduct. Oneida County District Attorney, Mr. Scott McNamara, who is also the President of the state district attorneys association said that a Task Force was already established in 2009 to address individual harms caused by wrongful convictions and to recommend reforms. He said creating an oversight panel would be redundant to the work of the task force. The bill now goes to Governor Cuomo’s office for review. Wednesday June 20th, 2018 (Thanks to WPKN volunteer editors Tony Ernst and Michael Zweig and WPKN reporter John Iannuzzi). In late March, Mayor Joe Ganim’s administration told the Connecticut Post after over a year of complaints that the equipment installed by Municipal Parking Services out of Minnesota was difficult to use, and that it scared away business, the meters would be replaced with less intimidating ones. Since being installed in 2017 the number of parking tickets in Bridgeport exploded, as did the number of appeals, resulting in the city’s sole parking hearing officer resigning from being overwhelmed. Early this spring the city decided to start fresh, end its relationship with MPS and go with camera-less meters provided by IPS Group of California. The city is spending about $600,000 for 630 IPS meters which are due around June 30. Only in Bridgeport reports that Mayor Joe Ganim, as he approaches the Democratic Party gubernatorial primary, has expressed strong opposition to President Trump, in marked contrast with his past reluctance to criticize the president. Ganim is in full campaign mode, as his underdog battle against Democratic-endorsed Ned Lamont presses on. The New York Civil Liberties Union is appealing the dismissal of a lawsuit that sought to give farmworkers labor rights like collective bargaining. The organization, which is representing a fired farmworker and several workers' rights groups, filed the lawsuit in 2016. A state Supreme Court judge ruled in January that the State and the NYCLU "had not demonstrated that the Labor Law statutes are racially discriminatory or that farm workers are a suspect class entitled to constitutional protections." A study, published Tuesday by the private New York State Health Foundation, is the first-ever statewide look at the financial entanglements between physicians and opioid manufacturers. The study showed that New York doctors who received speaking fees, gifts and meals from the makers of addictive opioid drugs in 2014 and 2015 prescribed more opioids than their peers who did not receive anything.The report compared two groups of physicians in New York, both with a similar specialty mix so as not to skew the data. The analysis found a clear pattern. Doctors who got their first payments in 2014 increased their opioid prescribing more than twice as much over one year, specifically, the average cost associated with filling pain scripts rose 37.2 percent among the doctors who got paid compared to a 15.6 percent increase among those who did not. After two years, this gap widened even further. New Haven Police Chief has placed a hold on hiring up to 37 new members pending an investigation of the department’s background investigation unit. Allegations include fabricating background interviews attesting to the candidates’ integrity. Officer Leah Russo resigned from the force after the department discovered she had fabricated up to 17 background reports. Officials have reassigned the remaining six members of the background investigation unit to other duties. Senior officers will conduct a new review of all the background checks. Bridgeport-based People’s United Financial will acquire Farmington Bank and its parent company First Connecticut Bancorp for $544 million. Farmington Bank has 28 branches across central Connecticut and western Massachusetts. As of June 2017, the bank ranks 12th for deposit market share in Connecticut with nearly $2.2 billion and fourth in Hartford County, one spot ahead of People’s United. Combined, the banks would leapfrog TD Bank in Hartford County and trail only Bank of America and Webster Bank. Last year, People’s United bought Long Island’s Suffolk Bancorp and Philadelphia-based Leaf Commercial Capital. Bethany Bump reports in the Albany Times-Union that a study ordered by New York Governor Cuomo recommends the state legalize and regulate marijuana for recreational, adult use, the state's top health official announced Monday. Governor Cuomo has in recent months shifted his public stance on marijuana, a drug he once lambasted as a "gateway" to other, more dangerous drugs. In January, citing legalization in neighboring states, he said "facts have changed" on marijuana and that, as a result, state policy may have to change as well. The state-led study examined the effect that legalization in neighboring states would have on New York, as well as the impact legalization might have on public health, safety and the economy. It also looked at how recreational marijuana would be taxed, where it would be grown, how it would be distributed, the age of use, and the potential for drugged driving. Long Island Power Authority ratepayers are paying a disproportionate share of the $7.6 billion bailout of four upstate nuclear power plants. The bailout runs for 12 years and kicked in last year with an added charge in the electric bills of all New York State residents, businesses and other entities. A lawsuit is underway in New York State Supreme Court to end the bailout. The rate is based on a formula developed by Exelon, which owns in whole or part the four plants, and approved by the state. A plaintiff in the lawsuit calculates that LIPA ratepayers are overcharged many millions of dollars a year. The bailout is based on the governor’s claim that nuclear power plants do not generate greenhouse or carbon gases and should receive “zero emissions credit.” It has become a model for other states developing their own nuclear power plant subsidy programs financed by ratepayers. Malloy’s State Water Plan is designed to take into account the changing nature of regulations, climate and economic conditions. Mandatory water conservation during the state’s recent two-year drought had increased public concern. Environmentalists and consumer activists want more safeguards over the distribution of Connecticut’s public water. “Public trust is a policy that recognizes the public’s inherent right to clean air, clean water and a healthy environment,” said Alicea Charamut, a river steward with the Connecticut River Conservancy. Water utility officials insisted public’s water supplies are adequately protected dismissing the proposed “trust” language as “duplicative and unnecessary.” Malloy’s order directs the state Water Planning Council to implement the plan with help from an advisory council and to resubmit the plan to the General Assembly by Dec. 1, 2018. Jan Ellen Spiegel for The CT Mirror reports that Connecticut has entered the offshore wind energy world. The Department of Energy and Environmental Protection recently awarded its first offshore wind project to Deepwater Wind for a 200-megawatt installation in the state-owned area halfway between Montauk and Martha’s Vineyard. The project is expected to create 1,400 direct and indirect jobs and other economic benefits, including a $15 million investment in refurbishing the port of New London, a research partnership with UConn at Avery Point, and local partnerships with New London. Deepwater developed the nation’s first, and so far only, offshore wind project for Block Island. With projects in the works for Long Island, Maryland, and a 400-megawatt project for Rhode Island. The Connecticut project could begin providing electricity to the state by 2023. Andrea Sears reports for the Public News Service that workers at Kennedy airport allege Global Security Consulting Group is a repeat offender in continuing to violate New York state wage and hour laws. They say the company has not been paying required uniform allowances, wage premiums for people who work split shifts, and shifts longer than 10 hours. "It appears that even after settling the lawsuit for $700,000 of wages for workers that they didn't pay, they're continuing the same practice of stealing from their workforce," said Rob Hill, a vice president of the worker's union. Other airport companies schedule workers so they are paid for all hours they are there. Global schedules work by flights, leaving workers with hours of unpaid time between shifts. Thirty-six percent of college students nationwide struggle with food insecurity, defined by the U.S. Department of Agriculture as limited or uncertain availability of nutritious and safe foods. Six of the 17 colleges on Long Island have a food pantry, including Stony Brook, Nassau Community College, SUNY Old Westbury, Hofstra University, St. Joseph’s College and Suffolk County Community College. SUNY Farmingdale is developing one. To access pantries, students just show their school IDs. There are more than 570 campus food pantries nationwide, up from fewer than 10 in 2009. Governor Malloy vetoed a bill Thursday that would have changed how the state board overseeing Hartford’s finances would have operated. Legislators will hold a veto override session Monday, June 25 to reconsider some of Malloy’s vetoes. Bethany Bump reports for the Albany Times-Union:The New York State Comptroller’s Office found the state's Medicaid program paid $1.28 billion worth of premiums it should not have over a six-year period for people already receiving comprehensive, private health insurance. The bulk of it cannot be recovered, but the state Health Department has recovered more than $34.7 million. The inappropriate payments occurred from January 2012 through September 2017 and stemmed from how the state pays for Medicaid recipients enrolled in mainstream managed care plans. More than half of the inappropriate payments unearthed by the comptroller's audit were made without the state’s knowledge of overlapping coverage. The rest, however, were made despite that knowledge. State Comptroller Thomas DiNapoli says the Health Department could prevent unnecessary payments in both circumstances by improving monitoring efforts that would prevent, detect and recover inappropriate managed care premiums. Suffolk County Police and the Sherriff’s Department are cooperating with Immigration Enforcement Agencies. If someone is detained for low-level offenses such as driving without a license, they can be held and transferred to the custody of immigration enforcement. On Thursday, community members and clergy testified at the legislature’s Public Safety Committee on their experiences as court witnesses. Governor Dannel P. Malloy’s decision to veto a bill that allowed teachers to remove physically violent students in the interest of classroom safety prompted a spirited discussion Tuesday. Malloy said he wouldn’t sign the bill because it would unfairly target students of color for punishment. Those who worked on the bill gathered at the Legislative Office Building on Tuesday to express anger and frustration, but also hope that it would eventually produce an improved bill. The legislation would require local and regional school boards, as well as the State Department of Education (SDE), to address daily classroom safety in the same way current law dictates they address bullying and teen violence. It would allow teachers to remove students threatening harm to other students or teachers from the classroom. The Centers for Disease Control and Prevention found that 700 women in the United States die each year following pregnancy-related complications, a rate that has more than doubled since 1987. In Connecticut, there were eight pregnancy-related deaths from 2011 to 2014. So far no post-2014 data exists and, given the lack of funding, the situation is unlikely to change. On Tuesday, Governor Dannel P. Malloy signed a bill into law that would establish a Maternal Mortality Review Program within the state Department of Public Health to conduct a comprehensive, multidisciplinary review of maternal deaths. But data collection and analysis are crucial if maternal death is to be understood and prevented. The state has gradually reduced funding for the Maternal Mortality Review Committee, eliminating it altogether in 2015. Previously, the state had provided funding to the committee to support reviews of medical charts of mothers who died in childbirth. Jeremy Williams of Huntington Station has been named by the Huntington Republicans to run against Democratic state Assemblyman Steve Stern. This is Williams’ first time as a candidate. He is 22 years old.Stern took office after winning a special election in April. Williams has been a Republican committee member for about three years and works as a consultant. Stern, who was term-limited as a Suffolk County legislator last year, won a special election to fill former GOP Assemblyman Chad Lupinacci’s seat after Lupinacci won election for Huntington Town supervisor in November. Some vineyard owners on Long Island’s North Fork can’t make sense of their Town’s edict that food and wine don’t mix. The town of Southhold has begun issuing citations to vineyards that allow parked food trucks to sell food. Bill Ruland, Southold Town Board Member, said “The town code doesn’t permit retail sales in residential and agricultural zones.” However, those with a peddler’s license can stay at one location for 15 minutes or less. Perhaps there is cause for optimism: Anthony Sannino, owner of Sannino Vineyard in Peconic, said “with careful thought the town could revise the code to fit [food trucks] into the code.” Mr. Ruland is encouraging winery owners to attend town meetings to make their voices heard. Along with the Massachusetts attorney general, city officials in Norwalk and Danbury Connecticut announced Tuesday they were suing OxyContin maker Purdue Pharma over alleged deceptive marketing of its drugs, fueling their states’ opioid crisis. In the lawsuits, Stamford-based Purdue is accused of misrepresenting opioids’ benefits. The Massachusetts suit asserts the company recklessly pressured doctors to give higher, and more dangerous doses, to keep patients hooked on the drugs longer. Massachusetts Attorney General Maura Healey says: “Purdue Pharma and its executives built a multibillion-dollar business based on deception and addiction.” The drug maker denied the allegations, although they said they shared Healey’s concerns about the opioid crisis. There were 1,038 fatal drug overdoses in Connecticut last year, up 13 percent from 2016, according to the state Chief Medical Examiner’s Office. The cities of Ansonia and Derby joined Norwalk and Danbury in filing in state Superior Court their lawsuit against Purdue Pharma, which names as defendants a number of other pharmaceutical firms as well. In his quest to qualify for an August 14 primary against Democratic-endorsed Ned Lamont petitioning candidate, Bridgeport Mayor Joe Ganim has amassed roughly 32,000 signatures, 10,000 from Bridgeport, about twice the verified number he needs. Yesterday was the last opportunity to submit signatures to local elections officials who will review the petitions to verify that they are Democratic electors in Connecticut before final tabulation by the office of the Connecticut Secretary of the State. Petitioning candidates need a surplus of signatures because many will be rejected for lack of party affiliation compliance. In some instances, one-third, or perhaps more, will be rejected. Ganim’s main opponent, the endorsed candidate Ned Lamont, is a successful businessman living in Greenwich Connecticut. The Shinnecock Hills Protectors demonstration continues from 6 to 7 am through Saturday at Montauk Highway and Tuckahoe Road, Southampton. Connecticut home prices still have not recovered from 2008’s Great Recession, according to the Federal Housing Finance Agency. Connecticut also is the only New England state with less than 100 percent job recovery since the recession, according to recent Bureau of Labor statistics. Over the last five-year period, home prices in Connecticut have risen only eight percent while the national average was 34 percent. Hartford ranked seventh from the bottom for metropolitan areas. Klepper-Smith said Connecticut has recovered only 78 percent of the jobs lost since the recession but that recent data show employment increasing and that full recovery should occur by 2020. Connecticut legislative leaders and consumer advocates pledged Monday to block President Trump’s repeal of net neutrality rules that prevented internet providers from throttling speeds or blocking content. Several states passed legislation requiring internet providers to adhere to net neutrality practices. A similar bill passed the Connecticut Senate this year but stalled in the House. The bill required internet service providers to register with the state as a utility and pledge to treat internet content fairly and equally. State Consumer Counsel Elin Swanson Katz said without net neutrality, providers will be "at the mercy" of large internet providers who can block, throttle or discriminate against access to content. ACLU of Connecticut executive director David McGuire agreed that lawmakers must take action. He said, "The end of federal net neutrality protections is a sad day for democracy, free speech, justice, education, health and small business, but the fight is not over." New York State’s Board of Regents tentatively agreed to controversial new rules aimed at school districts on Long Island and across New York where large numbers of students boycotted state tests. According to a Newsday survey, nearly half of all eligible students in Nassau and Suffolk counties declined to take the state’s April English Language Arts assessments in grades three through eight. The Every Student Succeeds Act requires at least 95 percent of eligible students in every public school nationwide to take annual state tests in English and math. Only a handful of schools on Long Island met that requirement due to a series of boycotts. State Education Commissioner MaryEllen Elia says a final Regents vote on the rules will take place in September and the public has opportunity to comment in the meantime. Kelly Zegers reports for the Suffolk Times that organizers of a new North Fork chapter of the League of Women Voters were surprised by the large turnout for their first exploratory meeting. About 60 people showed up at the Cutchogue New Suffolk Free Library last Monday, twice as many as anticipated. The next meeting will take place on Monday, June 25, at 6 p.m. at the Library, to discuss forming committees, said Barbara Best of Cutchogue. Also planned is a voter registration kiosk at the Cutchogue Library, with emphasis on registering 18-year olds. Treasurer Denise Nappier announced Connecticut easily sold $492 million in bonds with so many additional orders that interest rates were lowered. Christopher Keating writing the Hartford Courant reports this was the first time Connecticut's bonds included a specific covenant, or promise, the state will improve its fiscal condition. The Wall Street Journal described the covenant as “a rare step in the world of municipal debt.’’ The covenant includes spending and bonding caps inserted into the bipartisan budget agreement by Republicans, passed and signed into law by Gov. Malloy last fall. The largest portion of money from the bonds will pay for school construction. Also to be funded are cleaning up contaminated brownfield properties, economic development, town grants, capital improvements and clean drinking water programs. The covenant also included a “volatility cap’’ advocated by Hartford's Sen. Fonfara that forces the legislature to place money into the rainy day fund for fiscal emergencies. I Luv Bridgeport, a group dedicated to promoting the city and changing its reputation, welcomes people from surrounding towns, but its main focus these days is on bringing out the city itself. Since its formation in 2013, I Luv Bridgeport has been developing projects to bolster the city’s economic and social growth. It is hosting a series of programs, including Downtown Thursday, the seven-week concert series kicking off July 12, which previously was geared toward attracting visitors from other communities. I Luv Bridgeport is also partnered with the Bridgeport Arts and Cultural Council, on the East End farmers market, and the July Art Fest. New York State Controller Thomas DiNapoli announced his office has begun audits into whether the New York City and State education departments are ensuring that schools have adequate and current safety plans in the event of either a school shooting or major emergency. A law enacted in 2000 requires schools to develop policies and procedures covering safe evacuation, communication in emergencies, emergency responder access to building plans, and school violence prevention training. A U.S. Bankruptcy Court for the Eastern District of New York this week approved the sale of Dowling College’s Brookhaven Campus in Shirley to Triple Five, the Edmonton, Canada-based international conglomerate, according to Denise Civiletti writing for Riverhead Local. Triple Five Aviation LLC will pay $14 million in cash for the 105-acre property. The Shirley campus has adjacent access to an operating airport with two 4,000-foot runways and was home to the Dowling College School of Aviation and the National Aviation and Transportation Center. According to company spokesperson Stuart Bienenstock, Triple Five sees the Shirley site as “synergistic” with the EPCAL site it hopes to buy, envisioning EPCAL as the “epicenter” of eastern Long Island becoming again a hub of the aviation industry. According to Bienenstock, the company anticipates closing on the deal “within 45 days,” although a Brookhaven Town spokesperson says no site application has been submitted. Emilie Munson reports for the Connecticut Post that on Thursday, GovernorMalloy vetoed a bill that would change how a child was removed from the classroom after an alleged incident. He objected to the bill’s language as too vague, giving a teacher too much discretion in removing a student, and complicating the student’s return to the classroom. 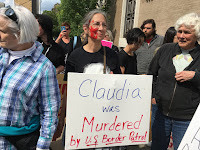 Several groups from around Connecticut organized a protest outside the federal building in Hartford, which houses federal immigration offices, to target abuses at the border. WPKN’s Melinda Tuhus has more. They were protesting the recent deaths of two women migrants on the U.S.-Mexico border, as well as the Trump administration’s recent decision to separate parents seeking asylum in the U.S. from their children, even very young children, in an effort to discourage immigrants from trying to enter the U.S. They also pointed to mistreatment of immigrants right here in Connecticut. The blue “I Love NY” signs along New York's highways likely won't come down by the summer as expected. Governor Cuomo's administration had pledged to remove and replace the controversial signs by the summer tourism season after the Federal Highway Administration docked the state $14 million because the signage doesn't comply with federal and state rules. The signs don't contain any navigational information—a key requirement. With state and federal governments gridlocked on replacements, the current signs remain. The rules could be temporarily suspended if the state receives federal approval to experiment with new signs. According to the highway administration, if the state removes the signs by September 30 the $14 million will be returned. Opt-out movement leaders criticized proposed legislation, for insufficiently reducing student scores in evaluating teachers. They said they would probably continue the exam boycott even if the state legislature approves the measure. The legislation, in part, would make using students’ state test scores optional rather than mandatory in evaluating teachers’ jobs. Long Island parent representatives said the law should be entirely repealed. However, New York State United Teachers contends the legislation would support progress in decoupling standardized tests and job-performance ratings. Fierce opposition to standardized state tests ingrades3-8 in Nassau and Suffolk counties has led to more than half the region’s eligible students skipping state English assessments in April. Concerns include the contention that linking students’ scores to teachers’ evaluations places undue pressure on both groups. and Sag Harbor launches water quality initiative. A new state-of-the-art Department of Motor Vehicles Express Center, where people can renew their licenses and ID cards, opens this morning at a Nutmeg State Financial Credit Union location in Milford, Connecticut. The center will replace eight New Haven and Fairfield County AAA offices that discontinued the same services when it failed to reach agreement with the state at the end of 2016. Non-Nutmeg members will pay a $5 fee to complete transactions; this fee will increase to $8 on July 1st. AAA had also been charging a $5 fee. The Milford express center location will enable customers to renew driver’s licenses and ID cards while using services that will offer the convenience of scheduling appointments, having service tickets stamped with same-day times, the use of self-service information kiosks, and communication via text and email. Eligible customers will also be able to register to vote. At Tuesday’s Town Board work session, Town Board liaison Bob Ghosio said that he, the town’s helicopter noise steering committee, and local pilots are expected to meet Friday to get closer to developing a comprehensive and balanced draft law. The promotion by helicopter companies of wine tours that bring customers from Manhattan to the East End is one area of concern. Wings Air Helicopters is currently promoting a North Fork winery tour that will fly from Manhattan and land at the Mattituck airport, where a waiting sedan would provide transport to the wineries. Riverhead’s 2003 master plan and key zoning codes aimed at protecting agricultural lands and preventing commercial sprawl have been upheld by a state appeals court. In three separate decisions dated April 18th, the Appellate Division panel upheld a July 2014 trial court decision in favor of the town, upholding the 2003 master plan and the Rural Corridor and Agricultural Preservation Zone codes. In a fourth decision, the court annulled a 2005 town board resolution implementing the transfer of development rights program. The court ruled that the town failed to give proper notice of the measure to the Suffolk County Planning Commission as required by state law. Overall, the decisions represent a major victory for the town’s land use plan, which sought to preserve agricultural land and prevent large-scale retail development outside the Route 58 corridor. Petitioning Candidate for Governor of Connecticut, Bridgeport Mayor Joe Ganim finds himself on the outside looking in, as four candidates who have met the criteria set by the Rell Center for Public Service prepare for a televised forum on Thursday. Only in Bridgeport reports event organizers are denying petitioning candidates not yet approved for the ballot, participation in tomorrow evening’s broadcast from the Lincoln Theater in West Hartford. Ganim is petitioning to primary Greenwich Businessman Ned Lamont in August, and he needs roughly 15,500 verified signatures from Democratic electors. The campaign reports it has already amassed about 25,000. The Bridgeport Mayor tells WPKN if he was allowed to be a part of the forum, his message would remain consistent. For his part, endorsed candidate Lamont is taking aim at struggling cities like Ganim’s. He says the answer is not bailouts, but shoring up transportation infrastructure. Organizers say the criteria for tomorrow’s forum, which was developed weeks ago, was to invite party endorsed candidates for governor and candidates who secured 15 percent delegate support at the respective party conventions. That leaves Lamont as the only Democrat that will be on stage. Meanwhile Endorsed Republican Mark Boughton, Mayor of Danbury will be joined by Former Trumbull First Selectman Tim Herbst and Navy veteran Steve Obsitnik received enough support at the Republican convention for August primary ballot spots. Parents, athletes and coaches in some communities are calling for a change in Connecticut Interscholastic Athletic Conference rules allowing high school athletes to compete in the gender specific sport in which they identity. They assert a possible competitive advantage after the success of transgender female athletes participating in high school track and field events. Continued success by transgender athletes has prompted two petitions from critics who say transgender athletes have an advantage. Together, the petitions have about 150 signatures, though neither has been submitted to CIAC officials. Bianca Stanescu, mother of Glastonbury sophomore sprinter Selina Soule, has been circulating a petition at track meets calling on the state legislature to require athletes to compete in sports based on their gender at birth, unless the athlete has undergone hormone therapy. But advocates for greater inclusion of transgender athletes and other competitors in Connecticut are pushing back, rejecting the position by petitioners as narrow and discriminatory. County Executive Steve Bellone has rejected Suffolk County Community College trustees’ request for a 4 percent increase in the county contribution to their proposed budget, offering a 1.84 percent hike instead. Bellone said he also has filed a legislative resolution to reject the trustees’ proposed $226 million budget, which would cost the county an extra $1.6 million. College officials say they will continue to lobby county lawmakers for a higher county contribution to keep the proposed tuition increase of $350 next year from going higher. Without a 4 percent hike in county aid, the tuition would rise from the current $4,870 to $5,270 a year. The Connecticut General Assembly is unlikely take up online gambling during its special session to consider legalizing sports betting — saying the smartphone-betting concept requires deeper study and public input. Governor Malloy said he is negotiating with the state’s two federally recognized tribes, the Mashantucket Pequots and Mohegans, in response to a U.S. Supreme Court ruling that opens all states to sports betting. If Connecticut legalizes sports betting, the tribes are permitted under the federal Indian Regulatory Gaming Act to open sports books at their casinos. It is unclear whether the tribes’ gambling agreements with the state will permit them to claim a share of the state’s sports action or exclusive rights to sports wagering. Connecticut has asked the Federal Emergency Management Agency to conduct a joint damage assessment in Fairfield, Litchfield, and New Haven counties created by the May 15th tornadoes and macroburst. The request asks for the preliminary damage assessments to begin next week. The assessment is a key step toward getting federal funding for storm damage and cleanup. Governor Malloy will send the completed aid application to FEMA and ultimately to the president for approval. Danbury officials estimate nearly $4.8 million in repairs, about $1.8 in New Fairfield, and almost $3.8 million in Brookfield. Other towns hit hard by the storm include Oxford, Beacon Falls, Seymour and Bethany. New York’s Department of Environmental Conservation wants permanent prescription drug collection boxes at all retail pharmacies throughout the state. The proposal calls for a sweeping statewide pharmaceutical stewardship program to be developed, implemented and paid for by a newly created pharmaceutical organization fully funded by drug manufacturers. The organization would bear the approximately $5.75 million cost of supplying collection receptacles for all 4,600 retail pharmacies in New York and $10.6 million for box liners and disposal. Manufacturers agree to their key role in the program but not to being its only funders. Although the proposal requires new legislation, the appetite of state legislators for adopting such a plan, especially if opposed by the powerful pharmaceutical industry lobby, remains to be seen. Gubernatorial candidate Cynthia Nixon proposes a simplified override of the state’s 2 percent cap on school property taxes by allowing a school board rather than the public to start an override with a 60 percent majority. Currently, residents of a school district can exceed the 2 percent cap, with a 60 percent margin during the budget votes but Nixon is suggesting that 60 percent of a school board could vote for a higher increase. The Cuomo campaign criticized the suggestion. Cuomo campaign spokeswoman Abbey Fashouer said: "That's not a cap. It is undoing the cap." Cuomo often points to the cap as an accomplishment meant to protect homeowners from rising taxes. Gov. Dannel P. Malloy on Friday expressed serious concerns about a bill to expand insurance options for pregnant women. Praising the bill for its “public policy goal,” Malloy also predicted that it would destabilize the insurance market, causing premiums to rise. The measure would allow women to sign up for health insurance when they learn they are pregnant, instead of waiting until an open enrollment period. Bipartisan advocates said that classifying pregnancy as a “qualifying life event” would help pregnant women gain access to prenatal care. Malloy did not sign the bill, a signal of his discomfort with the measure and the first time Malloy has allowed a bill to become law without his signature. In a letter to lawmakers, Malloy said he took that approach to draw attention to the issue. All the sixth graders in a New Haven private school had to do projects on sustainability. One student took his project one step further and organized a rally in a local park on Thursday. WPKN’s Melinda Tuhus was there. Sam Rosenberg, joined by classmates from Cold Spring School, his teacher, some parents and local activists, called on several speakers at the rally in Wooster Square, including a Yale professor, a representative of Sen. Chris Murphy’s office, and a member of the Sierra Club and of a New Haven group who are pushing for 100 percent renewables in the power sector by 2030 or sooner. Rosenberg was the wrap-up speaker. (applause) "This is our fight. It is our responsibility to keep the environment healthy. It’s our fight to think about our impact to the climate. It’s our fight to do things that will lower our carbon footprints. It’s our fight to let our representatives know how we feel!" Afterwards the 50 or so people marched around Wooster Square. (applause, cheering) It’s our fight! Bernard Krupinski and his wife, Bonnie Krupinski, both 70, were among four people on board a small plane that crashed Saturday afternoon, in the ocean about a mile and a half south of Indian Wells Beach in Amagansett. Their grandson William Maerov, 22, and pilot Jon Dollard, 47, were also aboard. Bernard Krupinski was an East Hampton native and builder to the stars. Bonnie Krupinski was a developer and businesswoman. The couple’s influence was far-reaching, from board positions to social and political contacts, and among their many friends. A new report from CoreLogic, based on forecasts from the National Oceanic and Atmospheric Administration (NOAA), nearly seven million homes are at risk of hurricane storm surge, 726,000 of them in New York. As it did in 2017, the National Flood Insurance Program is set to expire in the middle of hurricane season if Congress fails to act. Emergency management experts are calling on Congress to fix the 50-year-old program, which is billions of dollars in debt. Total reconstruction costs are forecast to exceed $1.6 trillion this year, an increason of 6.6% over 2017, due to higher costs for construction, equipment and labor. Although the federal program is the only option for many homeowners in areas where insurance is mandatory, reform though private-sector options has proved challenging.